Level up your IG game. If you look at a Singapore hashtag or geotag, chances are, you'll be greeted by thousands of Insta posts of Gardens by the Bay, Marina Bay Sands, or Sentosa. People flock to tourist attractions for a reason. But if you're just going to a place you've been to before or if you want to add a creative spin to your feed, then follow the steps of Rich McCor. 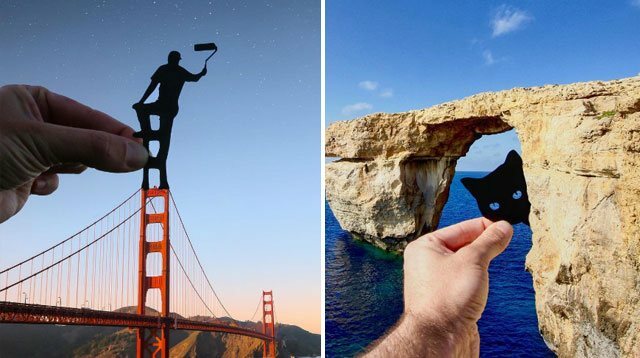 The Instagrammer creates paper cutouts and incorporates them in his photos of famous places. Rich told Vice that while he does bring his materials to the actual landmarks, his photos take a lot of prep time: "Let's say I'm traveling to New York. Before I go, I'll print out as many photos of the city as I can. Then, I'll get a pencil, and I'll doodle ideas on top of the prints. And when I get one that I think works, I'll make the cutout for it. But I still take my scalpel knife, cutting board, and bits of black card in case I get an idea once I'm there."